It doesn’t matter if you are young or old; making the most of your money now not only helps you plan for your own future but also for the lives of your loved ones. We appreciate it can be a tricky subject, and not particularly exciting, but it is very important… which is why we make things simpler for you by offering advanced wealth protection services and practical advice you can understand. Give us a call to arrange a no-cost meeting and see how we can help you ensure your wealth stays in your family rather than going to the tax man or an avaricious ex! Having a will lets you decide exactly what will happen to your estate (property and other assets) following your death. It gives you peace of mind that you’ve made the arrangements you want to make, and it helps reduce the burden and stress on family members at a difficult time. And to dispel a common myth… if you don’t have a will, then by law your partner may only be entitled to a certain proportion of your wealth: they will not get everything automatically. And then there’s probate to consider too; which needn’t be as stressful as the ‘horror stories’ you often hear… if you have a probate plan in place. We can help you create the right probate plan, which will provide your family with professional support and advice, from your chosen solicitor, when they need it most. And because you pay a fixed fee at today’s prices, your family and your estate are protected from rising probate costs too. Whether you’re looking for a will, a probate plan, or both… our specialists will guide you through the entire process, with expert and sympathetic advice to help you make these important decisions. If you would like to plan for any possible medical treatment pre-mortem, then we can guide you through the process of making a Living Will (also known as an Advanced Decision); which will make your wishes clear if you are on life-support and do or do not wish for extraordinary measures to be taken to treat you. Advanced directives are simply a more advanced version of a Living Will. They are a legally binding document which allows you to state your wishes whilst your decision-making cannot be questioned; so if you become injured or ill in the future, and are deemed to ‘lack mental capacity’ to make or communicate your own decisions, then your wishes will be known and will be acted upon. A GREAT WAY TO MAKE SURE YOUR BENEFICIARIES ENJOY YOUR WEALTH, RATHER THAN LETTING OTHERS ‘GET THEIR HANDS ON IT’! The assets you leave to future generations can be at risk from taxation and care costs. We can help you put the right trusts in place to protect your loved ones from incurring needless costs, thereby protecting their futures too. The right trust fund, personally created for you, will offer protections that a simple Will without Trusts cannot afford you and your family. 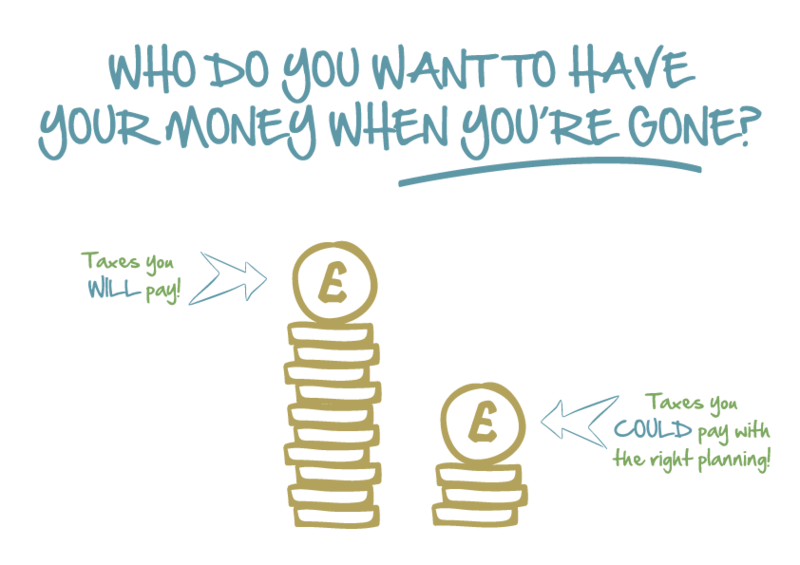 Find out more by downloading our guide to the benefits of wealth protection. Call us today to discover how you could be making the most of judicious trusts and smart tax planning. Who will manage your money if you’re not able to? What if you had an accident which resulted in you being in a coma? Or developed a condition such as dementia and could no longer understand your finances? Without the appropriate planning in place you could find the courts take over. But surely it would be best to have someone of your own choosing to act on your behalf? That’s exactly what a Lasting Power of Attorney guarantees for you; they’re simple to set-up, easy to understand and you don’t need to see a solicitor. Our experts can help you organise a Lasting Power of Attorney which covers decisions about your property and financial affairs, even your personal healthcare and welfare needs. And rest assured; we make sure your assets are fully protected. Your attorneys will not be able to dispose of any assets without applying through the courts; and even then they would need to prove it was in your best interest… a very difficult thing to achieve. Find out more by downloading our guide to Lasting Powers of Attorney. Call us today… we can help you make sure your future is in your own hands. Inheritance Tax is arguably one of the most despised taxes of all time. However much your estate is worth, we’re sure you don’t want to see it whittled away by the tax man… which is where we can help. You can reduce the impact of inheritance tax in a number of ways. Using your annual inheritance tax allowance, your pension, maybe incorporating a trust or making the most of the government’s ‘Business Property Relief’… they’re all possibilities to explore with your personal adviser at Wealth & Tax Management, who will guide and advise you on the most appropriate Inheritance Tax efficient investments. They will also advise on the impact of new rules and regulations, known as The Residential Nil Rate Band, which came into effect in 2017, making sure your Will and other arrangements take full account of these. And if we’ve already written your Will, we’ll be in contact to advise you of any changes which need to be made. Lastly, for a small monthly premium you can guarantee a lump sum for your beneficiaries, so inheritance tax is taken care of and they can inherit the full value of your estate. Let us help you protect your wealth for future generations. We’re sure it’s not something you really want to think about right now, but planning your funeral can take some of the burden and stress off your family, giving them peace of mind at a difficult time. It also makes sound financial sense! With one of our pre-paid funeral plans, you pay for your funeral now, at today’s prices… and based on rising funeral costs since 2000, this benefit is the equivalent of an average 14% annual investment return! Your family will not need to find extra money or take care of any arrangements, as everything is managed and arranged for them. The cost of residential care can seriously deplete your assets, even costing you the family home. We can help you avoid this by examining how you own your property and who you share that ownership with; and by changing the way your property is owned to protect your surviving partner and/or your beneficiaries. KEEPING YOUR PRIVATE INFORMATION SAFE & SECURE: GUARANTEED! Legal documents contain private and confidential information which could be at risk from unauthorised access, misuse or theft. Which is why we take secure storage of documentation very seriously indeed. Providing you with controlled, safe and secure document storage is extremely important in order to maintain your privacy, limit liability and ensure information is not misused, lost or stolen. We promise that whilst your documents are with us, they will be safe.